Over the past 18 months or so, we have been lucky enough to work with TeenTech, teaching app and games design and development at TeenTech Events all over the country. You can read about our work at the TeenTech events here – at each event, myself and Liz Rice from Tank Top TV work with 300+ teenagers a day, helping them to develop their ideas for apps and games. The annual TeenTech Awards are for UK students aged 11-16, and are designed to enable students to take their new found interests further. They encourage students to develop their own ideas for making life better, simpler, safer or more fun. Participating schools are provided with a suggested structure and industry contacts. The Awards ceremony was held yesterday at The Royal Society in London and I was honoured to be asked to be a judge at the event. 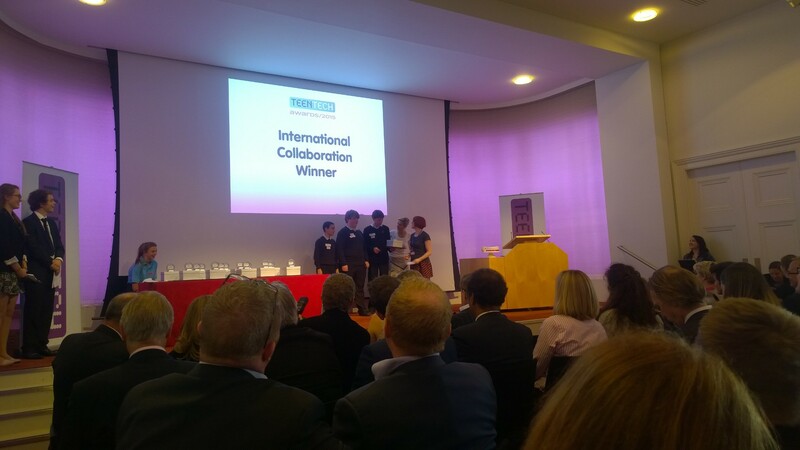 The King Edward VI School receiving the award for International Collaboration. Judged by Ali Maggs from Chaos Created and Liz Rice from Tank Top TV. We were judging the International Collaboration category. Impington Village College had developed a self-heating cup using an exothermic reaction to warm up a drink, or ready meal, on the go, appealing to climbers, travellers and parents. The King Edward VI School had developed an airship to transport aid to areas of natural disaster. Both teams gave outstanding presentations and had conducted some impressive research, reaching out to international companies, universities and individuals, which had helped shape their product. We awarded the prize to The King Edward VI School, but we also suggested that they might be able to collaborate somehow. How great would it be to deliver a self-warming meal to those in disaster zones? And that was a consistent theme throughout the day, as the TeenTech Awards are a great place for the students to meet other teams, and potential future collaborators! 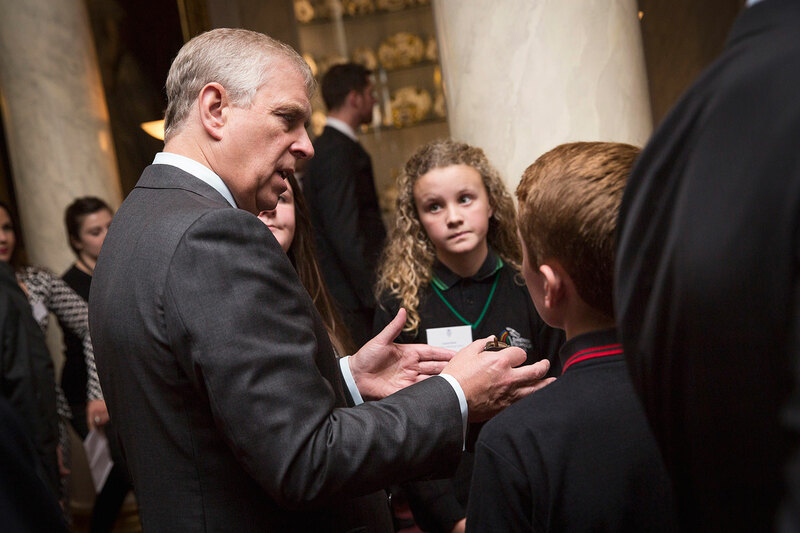 Over the past few months, I have also had a chance to mentor many of the teams that made it to the final of the TeenTech Awards, offering them feedback and suggestions as they developed their games, app ideas, and projects, as well as providing them with some technical knowledge when required. This was all conducted online via Skype, so it was amazing being able to meet four of these teams in person yesterday to see how their projects had progressed. We also had a chance to meet many of the other teams, and see a wide range of really interesting projects. One particular project, which was focussed on sustainable foods, had cakes made of crickets and ants, which I had a chance to taste (along with some whole mealworms and crickets). We are in London today judging at the #TeenTech Awards 2015. Myself and Liz got to try a cake made from crickets and ants. It was actually incredibly tasty! And there was a lot of thought behind the science and economics and how this could make a difference to the future of our planet. My own school, where I took my GCSEs and A-Levels, was there with some innovative safety jackets for primary school pupils and I look forward to visiting them in the future and helping them develop the idea into a retail product. It was such an inspiring day, and really great to meet so many enthusiastic and smart teenagers, and I’m really looking forward to another exciting year of TeenTech Events and seeing what the 2015-2016 TeenTech Awards has to offer.